Cost is a fundamental consideration in the selection of structural frame material and form, which is a key early decision in the design process. This selection should be based on project specific costings, and the challenge to the cost consultant is to recognise and reconcile fluctuations in material prices in relation to returned tender price data all in the context of limited available design information during early estimates. This article outlines a number of key cost drivers that must be considered in order to make steel frame rates project specific, and provides guidance on current cost ranges for different building types and locations. Through the identification of the key factors relevant to each project and the adjustment of typical rates accordingly, the accuracy of budget structural steel estimating can be significantly improve. The information presented here is based on a series of articles written by Gardiner & Theobald LLP, and published in Building Magazine from October 2011 to October 2016. This has been developed further with information from a series of articles written by AECOM, also published in Building Magazine, from 2017 onwards. For most projects, the decision on the frame material choice and form happens early in the design process, often on the basis of early design principles, limited information and budget costings. Once selected, the frame material is unlikely to change, as to do so can have significant programme implications from the consequential impact on the design of other major elements, such as cladding, service installations etc. While the decision on frame type for most developments will not be based on cost alone, it is nevertheless a key consideration in the decision making process and it is vital to support informed decision making with realistic cost information at this early stage, before refining during the detailed design stages. This is a challenging task as the cost of structural steel may fluctuate through the economic cycle, and reconciling material price information with returned tender prices is not always straightforward. Steel frame costs are also heavily affected by project specific key cost drivers, such as programme, access, spans and building form, making accurate adjustment of recently tendered rates or cost models difficult. 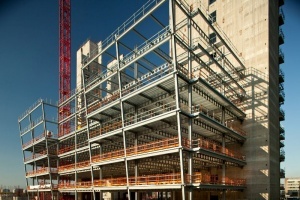 For those with limited previous experience of steel framed construction, the unique characteristics of the sector may not be immediately apparent. Anecdotal stories point to design decisions being made on the basis of non or poorly adjusted historic steel rates, suggesting that the complexities of the industry and the significance of key cost drivers are not necessarily widely understood. 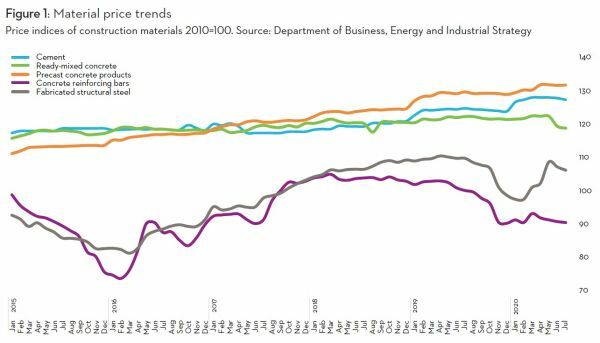 Steel’s high market share of just under 70% and a review of recent industry trends highlights the importance of maintaining current, market tested cost advice for structural steelwork. Through a consideration of a number of key factors and consultation with the market and supply chain, budget structural steel estimating can be quickly and successfully tailored to specific projects. As the selection of frame material is a key design decision and impacts on so many related building elements – foundations, finishes, wall to floor ratio and cladding to name but a few – once the decision has been made and design has progressed, it is disruptive and generally abortive to make fundamental changes to the frame type or form. To do so would involve going back over design stages already completed and will involve most of the design disciplines. Where there is a programme to be maintained, this is almost impossible to achieve. Therefore, although the period of time to identify and select the best value frame is not a long one, it should not be rushed. By its very nature therefore, the decision is commonly based on outline design proposals, with a limited amount of information available to the cost consultant. Where the initial budget estimates of steel frame costs are not realistic, the wrong frame solution can be selected at a higher cost of not only the frame but potentially also the related building elements. It can also have an effect on buildability, logistics and the construction programme, as the frame construction is a critical path activity. At the early design stages of any project, cost models, benchmarks and historic cost data are key tools used by cost consultants in the estimating of all building elements. At this stage, elemental costs, including that of the structural frame, will usually be expressed as a rate per m² based on the Gross Internal Floor Area (GIFA). Typical cost ranges for different frame types can be developed through cost models, and there are some indicative ranges given as part of this article, but how should one pitch the rate for any specific project? Rather than arbitrarily using the highest rate of a range, it is key to interrogate and understand what those rates buy and how the standard ranges can be adapted to suit project specific factors. To do this most accurately, the cost consultant needs to ask relevant questions of the design team and to speak to the supply chain to use this information effectively. This will build a picture of the current and short term future market, rather than relying on indices to adjust benchmark or historic rates. Different building functions across different sectors have varying typical frame costs due to their different usages of the created floor space. The usage of the building will influence the design loadings considered by the structural engineer and the building function will also result in different requirements for clear spans and floor-to-floor heights. This means that the average weight of the steel frame will vary between building types. For example, a low eaves industrial ‘shed’ building could have a frame weight of 40kg/m² GIFA, while a city centre office with a long spanning grid to avoid a forest of columns could have a weight of 90kg/m² GIFA. A requirement for fewer columns will lead to longer spanning beams and heavier steel sections, which can increase the overall weight of the frame and therefore the cost range for the building. Clearly, these factors need to be considered when determining the rate for the structural frame for early estimates. Confirmation of the design assumptions and principles with the structural engineer is essential to clarify this. It is also important to remember that the rate per m² is based on gross internal floor area, which will not account for variances in floor-to-floor heights. If for a specific project these are outside the normal range utilised in cost models, a higher or lower rate should be considered to tailor indicative rates to the project. The complexity of the structure is closely related to building form and function, as well as specific site conditions. The building form will have an impact on the regularity of the structural grid, and the need to introduce non-standard sections, a wide range of different sections and connections in order to achieve structural stability. Complex structural solutions, such as transfer structures, and fabricated beams may also need to be introduced to overcome project specific features or restrictions such as retained facades, adjacency of other buildings, ground conditions and so on. The inclusion of non-standard sections will also increase the overall frame rate as fabrication costs are higher. Complex connection details may also impact on installation costs, tolerances and interfaces. The location of a project is a key factor in price determination and indices are available to enable the adjustment of cost data across different regions. The variances in these indices, such as the BCIS Indices, highlight the existence of different market conditions in different regions, which must not be overlooked. Not only is the geographic location of the site an important consideration, site specific features also need to be reviewed. While the designed frame solution of two buildings may be very similar, the logistics and access arrangements will vary significantly between a city centre congested site and an easily accessible, isolated business park or industrial estate site, or even between alternative city centre sites. Working in city centre or occupied areas can mean restrictions to working hours, noise, deliveries and craneage, all of which influence installation costs and can result in an extended on site programme. As the frame construction is generally a critical path activity, any increase to the construction programme will have an associated impact on project cost. Accurate forecasts of steel frame costs are challenging due to the uncertainty of general economic conditions and the fluctuation of material prices experienced in the UK steel industry through the economic cycle. Economic and business sentiment in the UK held up until the final quarter of 2018. Now, though, many economic and business indicators are signalling a weaker picture for the economy. Individually, UK regions report along the same lines, with no divergence between economic sectors or size of firm. In turn, overall construction sentiment is being affected by Brexit uncertainty and falling new orders. Whether the former is the sole reason for the latter is a moot point. Nevertheless, a faltering economic situation – globally and in the UK – is certainly a key factor in pushing the cyclical picture. This said, trade and specialist contractors retain a slightly more positive outlook than main contractors on enquiries and workload further out into 2019. Despite prevailing uncertainty, operational challenges remain for the supply chain as current workload and projects are built out. Availability of labour and staff resources remains a management issue for supply chain firms. Last year saw some reduction in this pressure, but recruiting and retaining labour is still an operational consideration for many firms. Wage growth for site trades through 2017 and 2018 recorded a trend of being comfortably ahead of general consumer price inflation. The final quarter of 2018 saw a marginal yearly increase in wage growth, notably across later trade disciplines. However, early building trades posted weaker, if not negative, yearly rates of change, which probably reflects changing market dynamics in respect of new orders and output. Materials and labour input costs continue to push up a composite index for building costs. At Q4 2018 the overall index increased by 4.7% compared with the same quarter in 2017. This is the highest rate of building cost inflation in the last quarter of any year since 2008. Further increases on a yearly basis are expected through 2019, but the rate of change is forecast to slow from the recent peak late last year. Metals commodities prices have responded to a number of global themes throughout 2018: US dollar strength, slowing China economic data and global trade tensions. Some of the factors affecting the outlook for commodities have been demand-creating and some have been demand-eroding. However, commodities are finding it difficult to maintain upward direction, which is a clear indicator of faltering global economic activity. Input costs will remain a primary commercial pressure for the supply chain in 2019. For more than 18 months now, input costs have run at a higher yearly rate of change than tender prices. This dynamic weighs heavily on commercial operations for much of the supply chain, especially as prices sought for work are constrained to some extent by achievable output prices. Although there has been some pass‑through into output prices, there is likely still to be an inability to recover all of the input cost pressures, particularly as competition increases on a weaker overall outlook on future work. Clearly, this assumes a continuation of current input cost trends. Tender prices rose over the year by 3.5% at Q4 2018. Construction price inflation maintained a steady trend through 2018, but received another leg‑up as output figures saw a boost in the final quarter. Market dynamics are seeing emerging changes in risk allowances within tender submissions, on-going pressure from elevated input costs and some recruitment pressures. In combination, these trends are creating commercial pressures for the supply chain as output prices are constrained by prevailing competition levels and client willingness to pay. Aecom’s baseline forecasts for UK tender price inflation are 1.4% from Q1 2019 to Q1 2020, and 1.8% from Q1 2020 to Q1 2021. The rate of tender price inflation over the year ahead is based on output reverting to a long-run average without excessive volatility, elevated input costs as a result of weak sterling and general resource constraints. Higher expected economic and political turbulence has led to a pronounced downside skew to the assessed risks accompanying the price forecasts. Prevailing uncertainty around Brexit and a smooth departure for the UK from the EU is covered within these forecasts. However, extreme volatility from a no‑deal or disorderly Brexit, for example, are excluded from these inflation forecasts. In addition to understanding the cost drivers discussed above, it is also important to appreciate the different elements that make up the overall cost of the structural frame, their typical relative proportions and the interrelationship between them. It is often assumed that a frame with the minimum tonnage will also have the lowest cost. 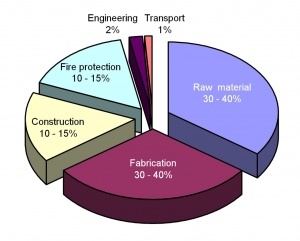 However, as the figure (left) shows, the raw material cost typically accounts for only 30-40% of the total frame cost, with fabrication costs also accounting for 30-40%. For more complex frame designs, with higher proportions of non-standard sections, complex connections or specialist systems with higher fabrication requirements, the overall rate per tonne is likely to be higher than for a standard frame. The construction of the steel frame typically accounts for around 10-15% of the total frame cost. It is therefore necessary to consider whether there are features of the proposed building that would significantly affect the erection cost as this will see a corresponding impact on the total cost of the frame. The extent of repetition, piece count, the type of connections to be used and access can all have a significant impact on the cost of constructing the frame. All of the costs include allowances for a concrete core. The rates have been developed from cost models of the different building types and for each the average weight of the structural frame has been given. As already highlighted, before using such ‘standard ranges’ it is important to confirm the anticipated frame weight and variables such as the floor-to-floor heights with the design team to determine whether they are above or below the average and to adjust the rate used accordingly. Similarly, all of the other key cost drivers of complexity, site conditions, location, function, logistics, programme and procurement strategy should be considered in turn. Low rise buildings with a regular, short span structural grid are typical features of business park offices and teaching facilities. A key feature of these buildings is flexibility, particularly for speculative business park developments that need to appeal to as many potential occupiers as possible. The buildings often need to be easily subdivided into smaller units and have large floorplates, typically are two to four storeys and have floor-to-floor heights of 3.75-4m. These buildings will typically have a uniform grid of 6-9m that provides largely column-free space and relatively high floor-to-floor heights. The lack of complex steel structures needed to construct the regular grid contributes to keeping the average steel frame weight down, typically 50-60kg/m2 including fittings, but this category can cover a lot of building types and functions. This central assumption therefore needs to be reviewed with the design team. Due to the low rise nature of these buildings, the fire protection requirements are not as onerous as for high rise developments and 30-60 minute fire protection would be considered standard. High rise construction (10-15 storeys) is a typical feature of city centre construction. These buildings will often require longer structural grid spans to achieve more open space in the lettable floor areas, increasing the weight of the steel frame. To maximise floor-to-ceiling heights and increase flexibility for the building fit out, cellular beams may be adopted with openings through the web for the distribution of services. City centre buildings are generally constructed on existing confined or irregular sites, which influence the building form and is likely to prevent the use of a regular column grid and may result in alterations to floor plates on the upper storeys. In mixed-use schemes, transfer structures may reduce the wider grids of office or retail areas at lower levels to a more rationalised residential grid on upper floors. All of these factors contribute to a higher average weight of the steel frame, typically 75-90kg/m² including fittings and, along with the increased complexity, result in significantly higher structural frame cost ranges than for the simpler, more regular low rise buildings. The rate range given in the cost table below is generally applicable for buildings up to about 15 storeys; tall buildings above 15 storeys start to have fewer comparables in terms of benchmarks and are likely to have a much higher proportion of complex elements, non-standard sections sections and complicated logistics, especially when constructed on tight city centre sites. The rate range for tall buildings can be 15-20% higher than the top of the standard range. Industrial buildings can cover a range of uses, including warehouses, non-food retail, science parks and distribution centres. The most common building form is a single storey warehouse with varying proportions of office space on a first floor mezzanine level. The traditional structural frame for an industrial building is a steel portal frame, as flexibility of the internal space is a priority, necessitating regular column spacings and long spans for a clear internal area. There can be variants on the standard frame design, however. For example, a steel portal frame incorporating northlights would need consideration when adjusting the standard cost ranges. The use of a northlight frame can increase the frame cost by as much as 30%. Fire protection requirements may also be considered as part of industrial building frame costs. The most common situation in which fire protection is required in single storey buildings is where it is necessary to satisfy boundary conditions; this is a project-specific factor that will need some liaison with the design team. Generally however, single storey buildings do not require fire protection. Another key factor in determining the frame cost of industrial buildings is the storey height of the warehouse space. While the gross internal floor area may be the same, the weight of the steel frame of a high eaves, single storey industrial building will be higher than for a low eaves building, resulting in a higher overall frame cost per m² GIFA. Typical structural steel frame weights for low eaves buildings (6-8m high) are about 30-40kg/m² overall of GIFA, including fittings and about 40-50kg/m² for high eaves buildings (10-13m high). However, ranges for high eaves buildings are generally wider than for low eaves buildings as they can have a much higher proportion of upper floor areas, across as many as 3 mezzanine levels; the frame rates for these buildings therefore need to be looked at carefully on an individual basis. The table below represents the costs associated with the structural framing of the three building types expressed as a cost/m2 on GIFA, and also provides some indicative cost information on floor types and fire protection. The rates should then be adjusted using location indices; the table provided below contains a selection of indices as published and updated by the BCIS. A key component of the cost of any building type is the frame which, for multi-storey buildings, accounts for approximately 10% of the overall building cost. The accuracy of any costing exercise depends on the level of design information on which it is based. As the design develops and more information becomes available, so the extent to which the cost can be detailed increases. The budget set at the early stages of the design needs to reflect the final build cost despite limited information being available. This means rates used during this phase need to include items which are not yet quantifiable. The steelwork quantity based on Gross Internal Floor Area (GIFA) or relative areas that the steel frame covers, which will depend on the building type and loading requirements. How the kg/m2 benchmarks against similar buildings. If the quantity of steel (kg/m2) accounts for fittings and steel-to-steel connections or whether an additional allowance needs to be made. The potential mix of steel members: columns, beams, fabricated/sections, etc. Consideration of the fire protection method and fire rating. Non-standard details such as cantilevers and transfers. The erection and lifting strategy and whether there will be a need for some members to be erected with mobile rather than tower cranes. Secondary steelwork including framing to risers, lifts and cladding. Connections to concrete or existing structures. Following consideration of all of the above a ‘blended all in’ rate is then derived and applied to the calculated kg/m2. These rates will then be reviewed against similar projects and steel frame types which provide analysis against benchmarks. Market testing should also be sought through consultation with steelwork contractors to ensure the accuracy of rates, forming a credible foundation for the steelwork costings to be developed in the subsequent design stages. As the design progresses, technical information from the structural engineer on the proposed frame will become available, allowing a more accurate and developed quantification of the frame cost, which will now include a piece count and review of the design evolution. The strategy for integration of mechanical and electrical services. 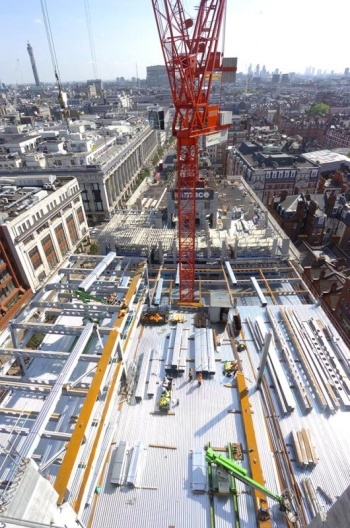 Miscellaneous items such as temporary steelwork, metal decking to composite floors, stairs, riser decking, external core angles, tower crane grillages, and stubs for BMU tracks. It is still important at this stage in the design process to continue to determine and redress what has not been included within the drawings and ensure that these missing elements are taken into account. For example the extent of secondary members should not be overlooked as these can account for a significant proportion of the overall steel piece count and cost. To calculate the cost of the structural frame, each of the components noted above will have a rate per tonne applied and then totalled. This rate should include the raw materials, fabrication, construction, fire protection, engineering and transport costs. There are risks and limitations in cost planning steelwork based on a simple rate per tonne as this does not take into account specific features such as long-span beams, cranking or tapering, curvature of steel, hollow sections, cantilevers, irregularity of grid, back propping and movement connections, all of which may require an adjustment to the basic applied steelwork rate. 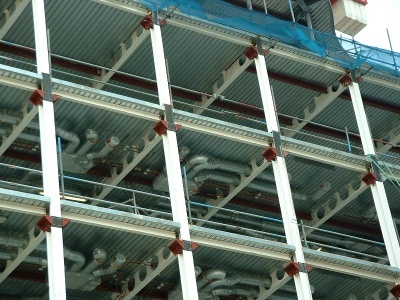 In November 2011, the BCSA and Tata Steel commissioned Gardiner & Theobald (G&T), Peter Brett Associates (PBA) and Mace Group to undertake an impartial study of current construction practice for multi-storey office construction to provide cost and programme guidance for Quantity Surveyors and design teams. PBA identified and designed representative framing solutions for two typical office buildings (Building 1 - A business park office, and Building 2 - A city centre office). G&T provided cost information for each frame option and Mace considered buildability, logistics and programme. PBA also carried out a cradle-to-cradle embodied carbon assessment on Building 2. The costs were regularly updated by G&T through to October 2016, and published quarterly in Building magazine as the ‘Steel Insight’ series. The last update of this study is available here. Later in 2016, the BCSA and Steel for Life commissioned AECOM to provide impartial cost guidance applicable to a broad range of construction professionals. Published quarterly in Building magazine, ‘Costing Steelwork’ is a new series in which AECOM provides guidance on the key elements of costing structural steelwork. These articles examine the key cost drivers for different sectors and provide up-to-date cost ranges for various frame types that can be used as a comparative cost benchmark. The series comprises studies into office, education, residential/mixed-use, retail and industrial buildings, and a key feature is a series of building type specific cost comparisons based on actual buildings. The buildings selected were originally part of the Target Zero study conducted by a consortium of organisations including Tata Steel, AECOM, SCI, Cyril Sweet and BCSA in 2010 to provide guidance on the design and construction of sustainable, low and zero carbon buildings in the UK. 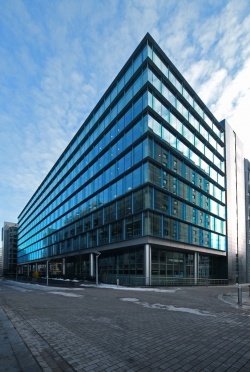 The building used for the cost model is a multi-storey office structure; One Kingdom Street, London. The project is located in the Waterside regeneration area near Paddington railway station in Central London. This Grade A office building was completed in 2008. The full building cost plans for each structural option have been reviewed and updated to provide current costs at Q1, 2019. The costs, which include preliminaries, overheads and profit and a contingency, are summarised in the table below. The analysis shows that the cost of the steel composite solution is 7% lower than the post-tensioned concrete flat slab alternative in terms of the frame and upper floors, and 5% lower on a total building basis. 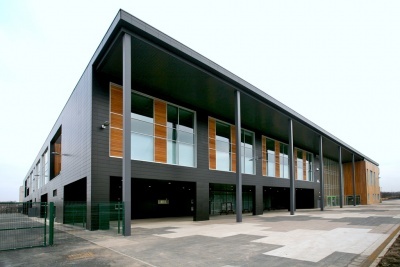 The building used for the cost model is the Christ the King Centre for Learning a secondary school in Knowsley, Merseyside. Three structural options for the building were assessed; a steel frame with 250mm hollowcore precast concrete planks and a 75mm structural screed, an in situ 350mm reinforced concrete flat slab with 400 x 400mm columns, and a steel frame acting compositely with a 130mm concrete topping on structural metal deck. The comparative costs highlight the importance of considering total building cost when selecting the structural frame material during design. The concrete flat slab option has a marginally lower frame and floor cost compared with the steel composite option, but on a total building basis, the steel composite option has a lower overall cost (£3,098/m2 compared with £3,124/m2). This is because of lower substructure and roof costs and lower preliminaries resulting from the shorter programme. 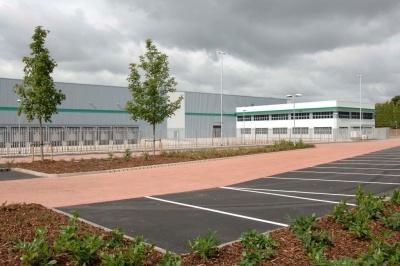 The building used for the cost model is a distribution warehouse on ProLogis Park in Stoke-on-Trent. Office: 1,400m2, two-storey office wing with a braced steel frame with columns. Three structural options for the building were assessed; a steel portal frame with a simple roof solution, a hybrid option, consisting of precast concrete columns and glulam beams with timber rafters, and a steel portal frame with a northlight roof solution. The steel portal frame option provides the optimum build value at £679/m2, with the glulam option being the least cost-efficient. This is primarily due to the cost premium for the structural members required to provide the required spans, which are otherwise efficiently catered for in the steelwork solution. The consequence of having a hybrid option is that the component elements are from different suppliers, which contributes to the increases in cost. The northlights option is directly comparable with the portal frame in relation to the warehouse and office frame; the variance is in the roof framing. There is significantly more roof framing to form the northlights. The additional costs beyond the frame are related to the glazing of the northlights and the overall increase in relative roof area. The building used for the cost model is an Asda supermarket in Stockton-on-Tees, Cleveland. Retail area based on a 12m x 12m structural grid. Three structural options for the building were assessed; a steel portal frame on CFA piles, glulam timber rafters and columns on CFA piles, and a steel portal frame with a northlight roof solution on driven steel piles. The steel portal frame option provides the optimum build value at £2,579/m2, with the glulam option the least cost-efficient. The increased cost is due to the direct comparison of the steel frame solution against the glulam columns and beams/rafters. A significant proportion of the cost for the building is in the M&E services and fit-out elements, which effectively reduce the impact of the structural changes to the overall building. The northlights option is directly comparable with the portal frame in relation to the main supermarket frame; the variance is in the roof framing as there is significantly more roof framing to form the northlights. The additional costs beyond the frame are related to the glazing of the northlights and the overall increase in relative roof area. The building used for the cost model is the Holiday Inn tower located in MediaCityUK, Manchester. Phase one of MediaCityUK started in 2007 and completed in 2011. Columns located on a 6.35m x 2.6m x 6.35m grid spaced at 7.5m. Three frame options were considered to establish the optimum solution for the building, a steel frame with Slimdek floors, a concrete flat slab and a steel composite deck on cellular beams (offices) and UCs used as beams (hotel). The full building cost plans for each structural option have been reviewed and updated to provide current costs at Q1 2019. The costs, which include preliminaries, overheads and profit and a contingency, are summarised in the table below. The steel frame with composite deck provides the optimum build value at £2,550/m2. However, it is important to note some project-specific factors influencing the decision to use a Slimdek solution for the actual, and hence the base case, building structure. The Holiday Inn tower building is connected to an adjacent studio block between floors one and seven. The long-span requirements for the studio could only be achieved using steel and therefore it was preferable to use a steel structure for the tower block to facilitate the integration of the two structures. Speed of construction was also important for the tower block, and this integration gave programme benefits relative to concrete solutions. The mixed-use tower block was originally designed with the lower floors as residential accommodation. Key design considerations for the hotel/residential tower block were floor depth and acoustic performance, and hence a Slimdek design was chosen. It was not possible to achieve the required floor depths using a cellular steel beam solution with downstands. The decision to change the residential accommodation to office floors was taken only at a very late stage of the project; this, coupled with the time constraints for the project, precluded redesign of the tower block and hence the original Slimdek design was constructed. The base case building structure is therefore a relatively unusual solution reflecting the constraints imposed by the wider MediaCityUK development and the concrete flat slab and steel composite frame are arguably more typical solutions for a building of this type. Steel continues to be overwhelmingly the structural framing material of choice for multi-storey non-residential buildings, according to the latest survey from independent market research consultants Construction Markets. The survey, commissioned by BCSA and Steel for Life, is the latest in a series going back to 1980 and is thought to be the biggest of its type in the UK, involving 735 interviews with construction specifiers. 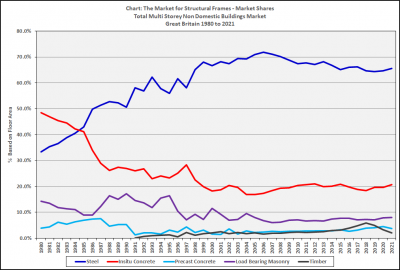 The results show that steel frames continue to have a dominant 64.7% share of the multi-storey buildings market. The survey also shows that the market contracted by 10.5% in 2018, with the overall floor area constructed in all multi-storey buildings reducing to 7,971,000m², which is 52.2% of the size of the market at its peak of 2008, when it was 15,266,000m². The survey also shows that steel now has a 70.6% share of the multi-storey offices market, and a 62.1% share in the ‘other multi-storey buildings’ sector, which includes retail, education, leisure and health. 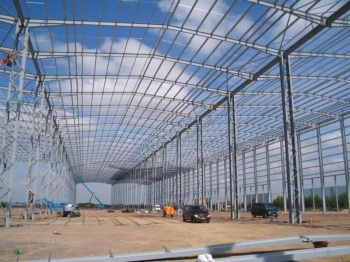 Steel framing is an economic means of providing long spans without the requirement for intermediate columns, thus creating increased open-plan space which is advantageous to office building letting. Tenant alterations are considerably less complex with steel-framed buildings, particularly major alterations such as the introduction of internal accommodation stairs or double-height spaces. This results in a reduction in on-site labour, which as a consequence reduces health and safety risks. The integration of services within the structural elements of buildings leads to economies in the construction by reducing the floor-to-floor height, which has a double benefit of reducing the external cladding required and also reducing heat loss through the envelope. In multi-storey buildings, service integration can allow extra floors to be provided within the same overall building height. The reduced weight of a steel-framed building has a beneficial effect on the foundation design. It allows the building to be constructed over restricted load areas such as railway station boxes and transfer structures. Steel frame installation and its ability to be pre-manufactured offers programme advantages due to certainty of delivery and speed of installation.